It’s been about 10 months since “it” ended. Ten months of adjustment, thinking, being a little angry, being a lot angry, not being angry as often, growing, learning, rediscovery, regaining hope, finding courage…well, you get the idea. This event, or the course I’ve taken since “it” ended, isn’t anything special or unique – I know that – but it’s been quite a trip for me. I’ve had great support, sometimes harsh criticism, but at the end of the day I’ve had a lot of people just wanting me to get to a place where I am happy. Let’s face it, people can only handle a downer to their party for so long and I had been angry, and a party pooper, for long enough. Being happy, especially after being so wounded, is easier said than done. While I would classify myself as a happy person, my mind does have a tendency to run rampant with doubt and fear – something that had grown in me over the last two-three years. I decided that I don’t want that any more – that no one wants that – so here it was, spring break 2013 and I had to choose: stay home or go. No companion, no partner, no friends, just me, the road, and a destination. I chose to go – and it was the best thing I could have done. We took advantage of the geographic location of the wedding to plan a short escape to North Myrtle Beach. The weather was beautiful even if the sun was scorching in its intensity. After getting in the requisite beach time, we moved on to other touristy activities. 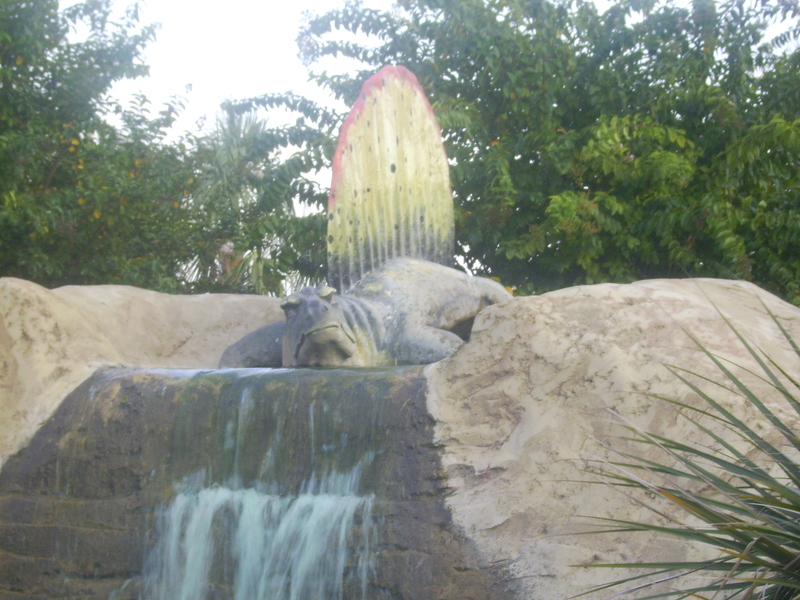 As mini golf is a non-negotiable component of any vacation itinerary we plan, we naturally ended up at Dino Adventure Golf. This putt-putt course was set in the lost Jurassic world discovered by the intrepid Professor Hacker when his hot air balloon is blown off course. First, I would like to note that this archetypal pulp story has fascinated me since the first Halloween my family ruled me too old at 10 to go Trick-or-Treating around the ridge. (Honestly, I would probably still be going if they had not intervened). That evening, I planned my own private celebration eating candy and listening to the local public radio Halloween programming. I remember listening to a radio adaptation of HG Wells’s The Invisible Man and being entertained. However, I was much more interested in the airing of radio-adapted Sir Arthur Conan Doyle’s The Lost World. 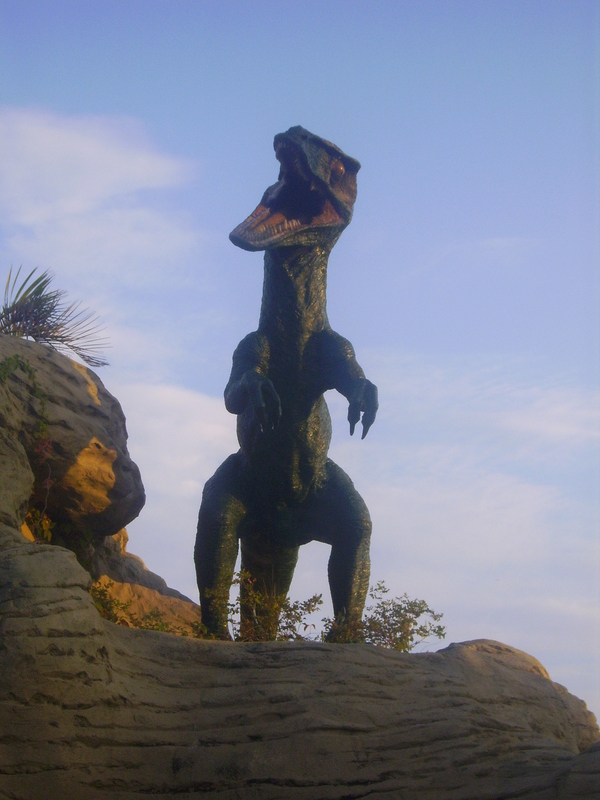 I remember being intrigued by the characters of intrepid adventurer, scholarly academic, youthful journalist, and the leading lady and their adventures in the hidden land of prehistoric dinosaurs. This radio show sparked my lifelong interest in pulp adventure novels and later Victorian sci-fi and steampunk that lead me on enjoy the works of classic authors Jules Verne and Sir Arthur Conan Doyle and contemporary authors Ken Scholes, Tim Akers, Gail Carriger and Cherrie Priest. The second great appeal of this course for both my husband and I was the dinosaur theme. While I entered and exited the common childhood phase of dreaming of being a paleontologist in favor of astronomy in the second grade, I’m not quite sure my husband ever did. 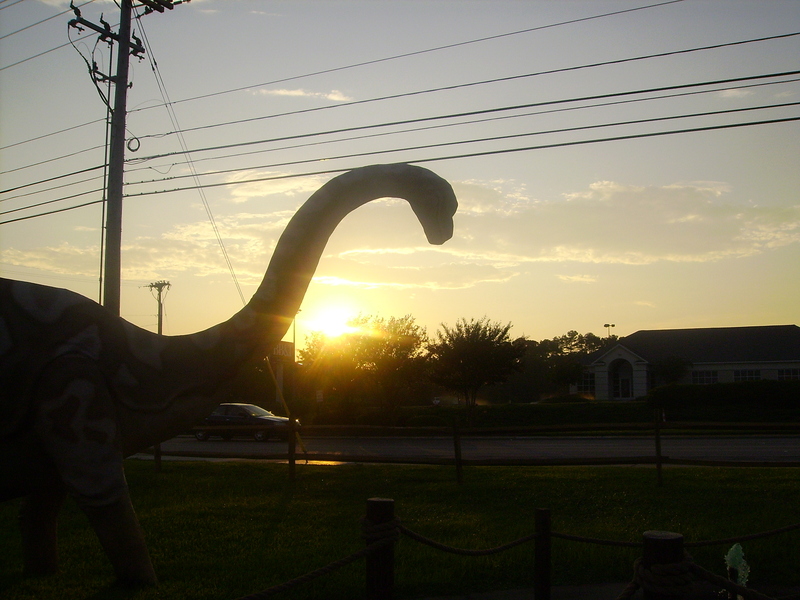 He was the child who loved all things dinosaur, knew the scientific names, and collected books and toys representing them all. To this day, when choosing toys for my toddler nephews, he leans toward introducing them to different Jurassic creatures over planes, trains, and automobiles. Finally, as we were putting around the course enjoying the Jurassic scenery, it occurred to me that someone had to build this set. It’s definitely not everyone who takes these things for granted, but it was somewhat of a revelation for me to realize that parts of the course were likely one-of-a-kind works of art. I suddenly saw the grumpy looking dimetrodon and the downcast gaze of the apatosaurus in a new light. Someone had to build, sculpt, paint, and arrange these dinosaurs. Art was not what I was expecting to find while putt-putting but it was really interesting to think about in terms of exposing the general public to mixed media, sculpture, and all the other techniques required to build an interesting course. With a little help from Google, it soon became apparent that mini golf as art was old news to professionals. An article by Jonathan Haeber detailing the history of mini golf explains that the design approach to courses has evolved through a number of stylistic eras from Romantic Era Emergence to Post Romantic Classicism to Sterile Minimalism to Cultural Renaissance, to Corporate Minigolf. There have even been a number of museum exhibits commissioned across the country over the past few years to create public art in the form of putt-putt courses including the Golden Door Mini Golf Course associated with the Jersey City Museum, the 9-hole Putting Lot in Bushwick and Figment’s City of Dreams Mini Golf 18-hole course on Governors Island, Contemporary Masters: Artist-Designed Miniature Golf at the Salt Lake Arts Center, and Smash Putt Golf in Denver just to name a very few. Many of these exhibits are temporary but it is likely that their impact on the thousands of enthusiastic, often young, and potentially museum-shy patrons they attract is more than just memorable. I have really enjoyed learning about this unique form of public art and hope you will click a few of the links above. I think mini golf is a really fun way to bring art, fantasy, and imagination to wider audiences than museums and art shows alone can attract. The accessibility and the enjoyment of these “exhibits”are evident when you see people from ages two to eighty-two smiling and pointing at a giant octopus or raptor. I know I will be examining my future mini golf courses with a keener eye in the future and hope you will, too.